Properties in Grey District average 4.5 out of 5 stars. Motukiekie beach. A jewel in the West coast crown. Property 5: Motukiekie beach. A jewel in the West coast crown. Charlies Farm Cottage - sunny central spot for fishing, swimming, exploring. Property 6: Charlies Farm Cottage - sunny central spot for fishing, swimming, exploring. Koru Beach Cabin/Bach. Free wifi/breakfast and hot tub. 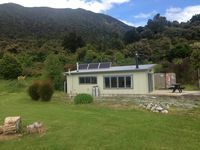 Property 15: Koru Beach Cabin/Bach. Free wifi/breakfast and hot tub. Old Saint Andrews CHURCH the heart of Ahaura !with old world war two cabin. Property 20: Old Saint Andrews CHURCH the heart of Ahaura !with old world war two cabin. Unique place to stay and get away! Property 30: Unique place to stay and get away! Roa Road cottage is close to the Paparoas and the new great walk opening soon. Property 35: Roa Road cottage is close to the Paparoas and the new great walk opening soon. Beachfront bach in the heart of Punakaiki. 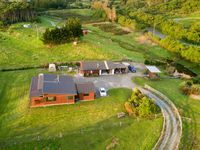 Property 48: Beachfront bach in the heart of Punakaiki. Spent 5 nights over easter in the cabin. Beautiful , cosy cabin with spectacular sunsets in the evening.. Just a 10 minute walk to the beach which took you past a lake full of black swans. And the beach just goes for miles and miles. And when you get back you can jump in the spa which looks out to the mountains and a lovely natural spring pond. A perfect location for us because we could take our dogs .